Charlie Sheen is living up to his title of Hollywood bad boy. Villa inside the Palms’s fantasy tower. ladies are holed up in a bathroom. Maybe the other two are just friends because Sheen is reportedly crushing on Olson. He reportedly spent the New Year with Olson in her hometown in Fort Wayne, Indiana. Moving on, according to a snoopy bystander, when Sheen hit the bar on Monday morning, he opened up and started to complain to his new bar friends that CBS executives have been urging him to enter a rehabilitation facility– While knokin’ back a few shots. during his now infamous October escapades. It appears as though Sheen either doesn’t want to deal with issues, or doesn’t think he has any issues. His inner circle has been very vocal about their concern for his health and well being. Sheen is reportedly on a private jet heading to Los Angeles. 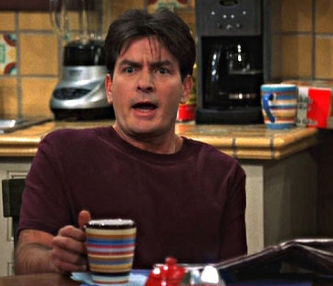 He is due on the ‘Two and a half men’ set at 10:00am PST. Oh Charlie, what a train wreck.